Residents refusing to vacate four north London tower blocks over fire safety fears are being told they "must leave". 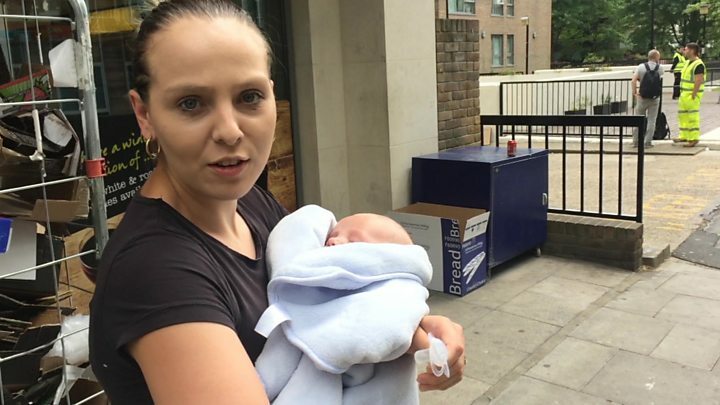 Camden Council said its staff would continue asking those people who had not yet left the Chalcots Estate in Swiss Cottage to move from their flats. About 200 people are refusing to move to temporary accommodation. Cladding on 34 tower blocks in 17 council areas in England has failed government fire safety tests - every sample submitted so far. The government plans to examine cladding from up to 600 buildings and Lord Kerslake, the former head of the civil service who who now chairs the Peabody housing association in London, has called for the testing process to be accelerated. Where have fire cladding tests failed? "We are told they can do 100 a day - that should be the number they are meeting," he told The World This Weekend on BBC Radio 4. He added: "This is clearly a terrible national disaster and demands a national response... As well as the public inquiry on the lessons learned we need to establish where the areas of the highest risk are and take action immediately. That's been a priority for me." The Department for Communities and Local Government testing programme began on Wednesday. Although every sample has failed to date, the DCLG pointed out that local authorities have been asked to prioritise buildings they had most concern over. Meanwhile, the leader of Camden Council, Georgia Gould, said residents will have to stay at a nearby leisure centre for a third night. She said the council had found accommodation for many families but some people who have been staying with friends and family are now asking for hotels. Officials would again visit residents still in their homes as they needed to leave the blocks before work on making the buildings safe could begin, she added. Ms Gould said: "We have also dispatched social workers to have conversations with those families, those individuals, about what will help them move out." She said some of the residents want to leave but are refusing to spend the night in the council rest centre. Some people have issues, including agoraphobia and needing medication, and want to be sure they have got suitable accommodation before moving out of their flats. Ms Gould said earlier there were "various legal routes that Camden Council could explore. However, we really don't want to do this". She later added: "If it comes to the point where people really, really won't leave that is absolutely the last resort. The last thing I want to do is force people out of their homes, and the conversations I have been having with residents in these buildings is that they are willing to work with us." Four of the five blocks on the Chalcots Estate were evacuated on Friday due to concerns about external cladding, gas pipe insulation, and fire doors. Camden Council said it had no option but to move residents from 650 flats while work takes place. But - across the country - not every block that fails safety tests will be evacuated. Communities Secretary Sajid Javid - while agreeing with the decision in Camden - said: "A failure in testing of the cladding does not necessarily mean that a building will have to be evacuated. "The decision by Camden Council was because the failed testing of the external cladding was compounded by multiple other fire safety failures." The Local Government Association said some councils have introduced 24-hour warden patrols to mitigate the risk before cladding is removed. It said in a statement: "For those areas still waiting for results of tests on aluminium composite material cladding, our advice to them is to prepare contingency plans so they can take any measures needed quickly." The Chalcots Estate's cladding is similar to Grenfell Tower in North Kensington, west London, where a fire is feared to have killed 79 people. Chalcots was refurbished between 2006 and 2009 by the same firm, Rydon, that oversaw work at Grenfell Tower in 2015-16. 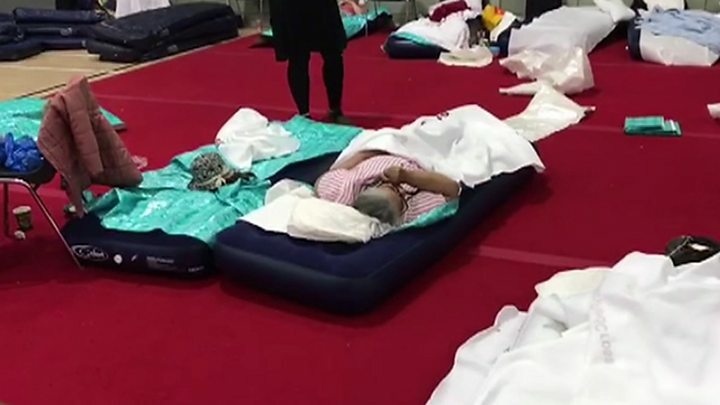 After the evacuation, emergency accommodation was set up at Swiss Cottage leisure centre and at the Camden Centre in King's Cross. Camden Council - which said it already spent £500,000 on hotel rooms - said it would reimburse residents who have paid for their own temporary accommodation. It has also set aside £100,000 for food and essential items for displaced residents. The work at Chalcots is expected to take three to four weeks. Sayed Mead, a resident on the estate who left his flat, told BBC Breakfast that not knowing where he was going to be housed had been "eating me away". He has now been given accommodation but said the council had created "panic" among the residents.